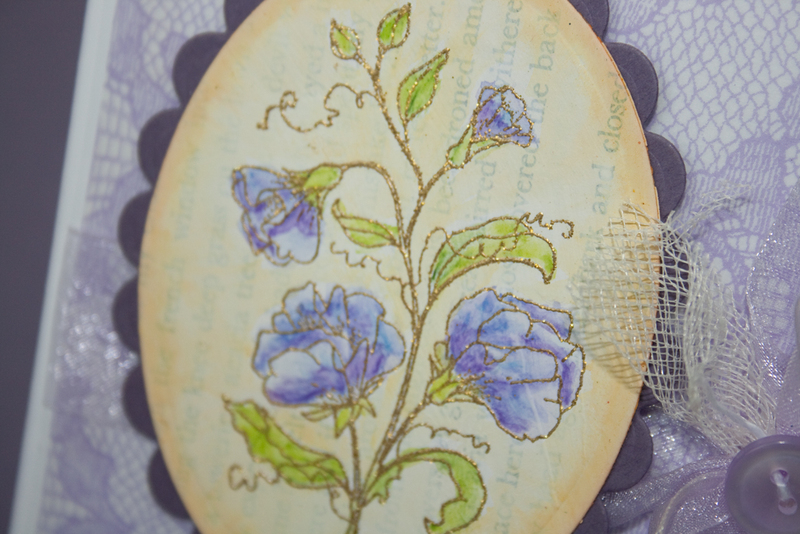 Since I had torn out pages of my Altered Book to make room to I had an abundance of pages and decided to use it for my card...how much fun!! I started by laying down a coat of Gesso on the page. Then I stamped and embossed the image with Gold Tinsel EP and watercolored it. 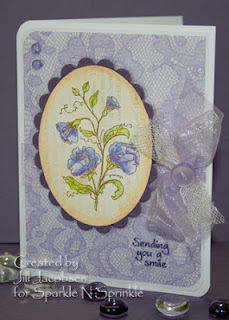 You can find all the details of the card here at Sparkle N Sprinkle. How creative and oh so pretty! What a fabulous idea Jill, and a great use of all those torn out pages! I love the subtle look you got from applying gesso over the printed page, it makes a wonderful background. This is really pretty, Jill. I love it! Great job! Awesome Jill. I need to get out that Gesso and play with it! Thanks for the inspiration - gorgeous! Uh and ah, I love the lace. Perfect background for the sweet peas. This is so pretty!! Love the soft look of your image layered on the lace background.